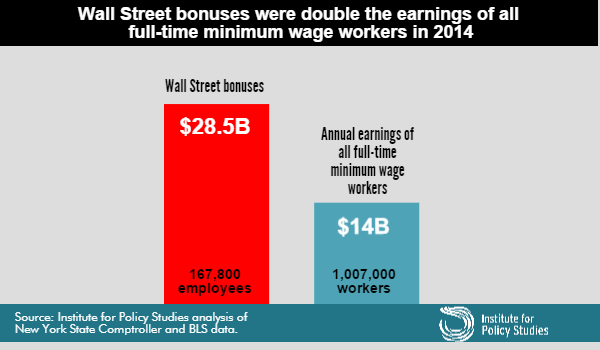 Total earnings of all full-time minimum wage earners in the U.S. came to less than half of the $28.5 billion Wall Street paid in 2014 bonuses. In 2014, Wall Street’s 167,800 employees got $28.5 billion in bonuses — double the total earnings of the 1,007,000 Americans who worked full-time at the federal minimum wage of $7.25 an hour, according to a new report from the Institute for Policy Studies. In Washington State (which has the highest minimum wage in the nation), the minimum wage increased to $9.47 on January 1. In the current legislative session, the Washington House passed a bill to raise the minimum wage to $12 an hour by 2019; the Senate is now considering the bill. And in Seattle a new ordinance increasing the minimum wage to $15 an hour will begin the first phase of its 7-year implementation plan on April 1st. Is $15 an hour a living wage in King County? For more about minimum and living wages in King County, see Communities Count’s living wage section and the latest Job Gap summary for Washington counties. According to the job gap study, a living wage for a single adult in King County is $17.37 an hour; for a family of 4 (a toddler, a school-age child, and 2 adults, 1 of whom is working), a living wage would be $31.93 an hour.